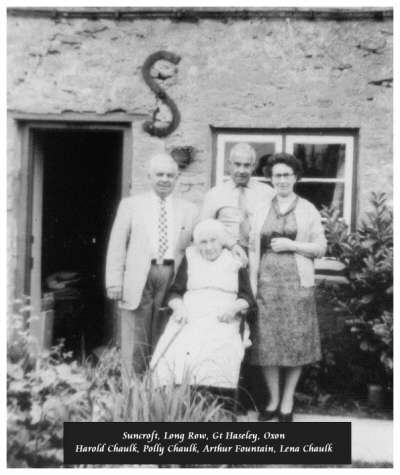 Mary Ellen Hardman was born circa 1887 at, St Helens, Lancashire, . 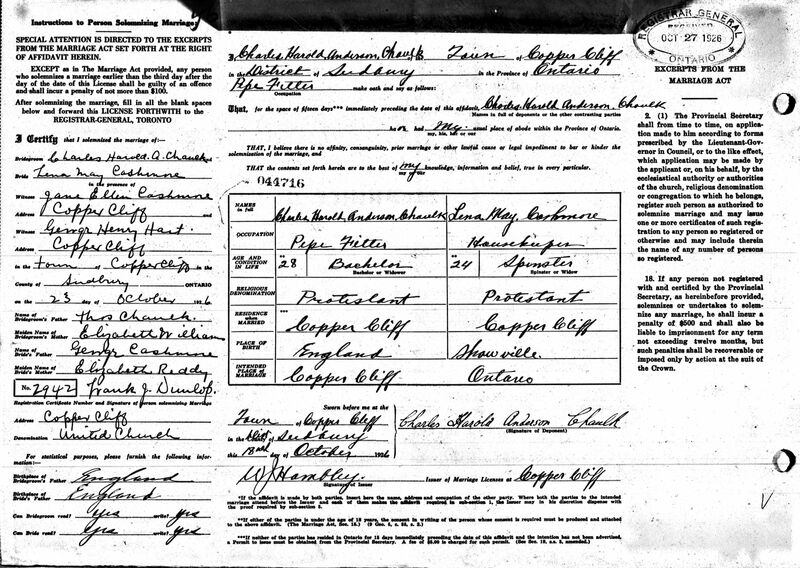 She appeared on the 1891 Census in 67 Peckers Hill Rd, Sutton, St Helens, Lancashire, and Daniel Hardman, Ellen Morris, John F. Hardman, Thomas Hardman, Elizabeth Ann Hardman, Daniel Hardman and Thomas Worrall were living in the same household; Daniel the head was a coal miner/colliery labourer, John a horse driver, and Thomas an India wagon sheet repairer. Her married name was Wing. 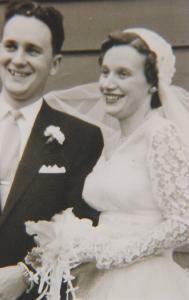 Geraldine Shepherd married Michael Wing. (an unknown value). Michael Wing married Geraldine Shepherd, daughter of Edward Frank Shepherd and Doris Richardson. (?) (?) married Ivor Richardson, son of (?) Richardson and Mary (Polly) Chaulk. Her married name was (?) Richardson. Lives 22 Horse Close Haseley 01844 279406. Charles Harold Anderson Chaulk was born on 30 November 1898 at St Helens, Lancashire. Charles Harold Anderson Chaulk also went by the name of Harold. He appeared on the 1901 Census in 24 Church Street, St Helens, Lancashire, and Thomas Chaulk, Elizabeth Catherine Williams, William Henry Chaulk, Mary Elizabeth Chaulk, Jane Ellen Chaulk, Christopher Chaulk, Emily Blanche Chaulk, Annie Chaulk, Maggie Chaulk and Thomas Chaulk were living in the same household; Thomas was described as a platelayer (railway), William a boilermaker and Mary a waggon sheet ringer. Harold was the great uncle of Beverley Craig and she writes, " Harold left England about the age of 16 years and enlisted in the army. 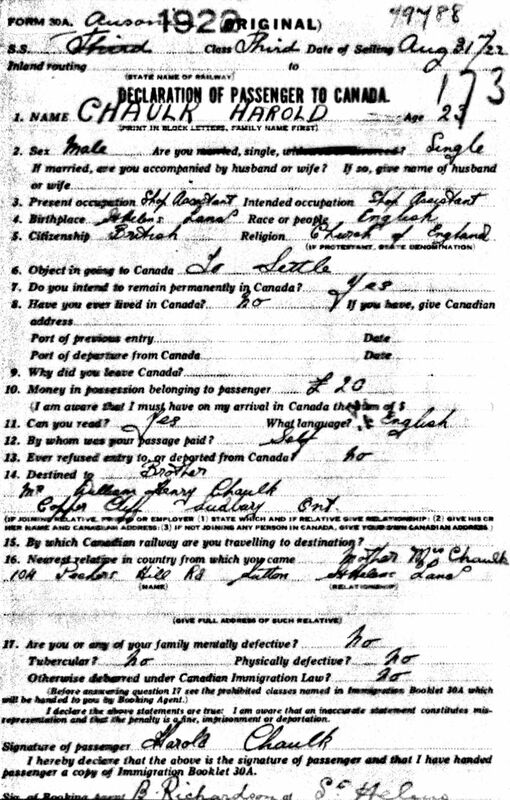 He left for Canada without telling anyone and arrived in Copper Cliff and asked where Billy Chaulk lived. He had to trudge through 6 foot of snow in a thin coat and no winter boots and was nearly frozen by the time he arrived at my grandfather's (William Chaulk) and my grandmother didn't know who he was. He lived with them for a while until he moved to Sudbury and became a postman. He worked for Canada post and retired about 1963." In the absent voters roll for 1918-1919 in St Helens, Lancashire, Charles Harold Anderson Chaulk (Pte 121039 RFC) is recorded at 104 Peckers Hill Road, Sutton. He also appears on the roll for 1920 and is still recorded as absent. 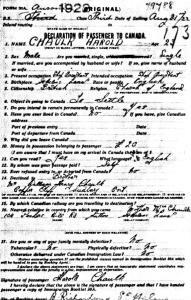 Charles Harold Anderson Chaulk emigrated on 31 August 1922 from, ; On the passenger declaration Harold gave his present occupation and intended occupation as shop assistant and his intention was "to settle" permanently in Canada. He said he had not lived in Canada before and had £20 in his possession. He was destined for his brother's home in Coppercliff, Sudbury, Ontario, and gave his brother's name as William Henry Chaulk. He gave his mother Mrs Chaulk of 104 peckers Hill road, Sutton, St Helens as his nearest relative in the UK. He married Lena May Cashmore on 23 October 1926 at, Sudbury, Ontario, , Canada, and the ceremony was witnessed by Jane Ellen Cashmore and George Henry Hart; Charles was a pipe fitter and Lena May a housekeeper. Charles Harold Anderson Chaulk died on 9 January 1971 at Sudbury, Ontario, Canada, at age 72. He was buried at Parklawn Cemetary, Sudbury, Ontario, Canada. His obituary said that Harold ran away from home at the age of 17 to join the army. He served in the Signal Corps and the Flying Corps in WW1. He went to Canada in 1920 and worked for the Post Office. It was said that he knew every man, woman and child in Sudbury, and he was on a first name basis with them all. Marriage* He married Lena May Cashmore on 23 October 1926 at, Sudbury, Ontario, , Canada, and the ceremony was witnessed by Jane Ellen Cashmore and George Henry Hart; Charles was a pipe fitter and Lena May a housekeeper. Her married name was Chaulk. Lena May Cashmore was born on 16 February 1902 at Shawville, Quebec, Canada. Lena was a sister of Florences ( #301) husband. She was also a sister of William Ernest Cashmore (#299). She married Charles Harold Anderson Chaulk, son of Thomas Chaulk and Elizabeth Catherine Williams, on 23 October 1926 at, Sudbury, Ontario, , Canada, and the ceremony was witnessed by Jane Ellen Cashmore and George Henry Hart; Charles was a pipe fitter and Lena May a housekeeper. Lena May Cashmore died on 13 October 1982 at Sudbury, Ontario, Canada, at age 80. Ronald Chaulk was born on 15 September 1931 at Sudbury, Ontario, Canada. He married Marilyn Irene Wright. Her married name was Chaulk. Marilyn Irene Wright was born on 26 October 1933 at New Sarum, Ontario, Canada. She married Ronald Chaulk, son of Charles Harold Anderson Chaulk and Lena May Cashmore. Robert Chaulk was born on 31 January 1955. He married Kay Bigelow. Very interesting. Yes. I am the grandson of Harold Chaulk, who last lived in Sudbury, Ontario Canada who did indeed marry Lena Cashmore. Harold had one son, Ronald who now lives in Arizona. Ron has two sons. Myself (Doug) and Robert, who lives in Southern California. I have a son, Kyle and two daughters, Kelli and Elizabeth. Robert has one daughter, Kristen.